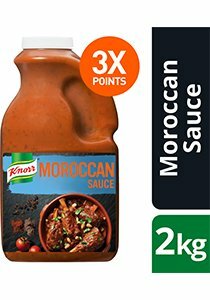 A flavourful, spicy sauce made with sultanas and ground spices, that is perfect for tagines, pies, pizza and braised dishes. Sauce for tagine, pies, pizza, braised dishes. To ensure a gluten-free meal, avoid cross-contamination with gluten during preparation. Bain Marie 4 hours at 75 degree Celsius. Suitable for freezing, combination oven.